I’ve been baking a lot of bread with this brown rice starter, and I’ll be posting a recipe soon! The bread is amazing, my husband said it was the first time he’s actually enjoyed eating gluten free bread and he didn’t have to toast it. Add 1/3-1/2 cup of flour and equal part water, roughly every 8 hours (3 times a day) for 4-6 days, whisking smooth and covering. You can dump off some of the starter before you feed it if you’re container is too full. Put it in the refrigerator after feeding if you can’t get to it for another 12 hours. 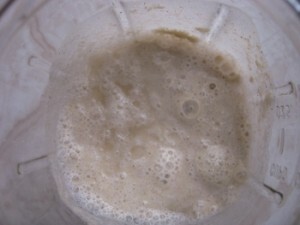 The “hooch” is the liquid that forms on top and gives the sourdough much of its sour flavor. You can mix the hooch back into the starter when you see it developing, or you can pour it off. If you feel like the starter is beginning to smell too vinegary, then pour it off. If you like the smell and the resulting sour taste, then mix it back in. After about 48 hours the starter should show signs of viability. If you don’t see any bubbles or hilling you can add another tablespoon of water kefir, kefir or a probiotic pill. By the third day you should see small bubbles especially during stirring. By the fourth day you may see bubbles of different sizes and there may be a hissing, bubbling sound when they come up from the bottom of the bowl. It should take about 4 days for a brand new starter to be ready for cooking. It may take less time in warm weather and more time in cold weather. Feed your starter and let it ferment for 8-12 hours and then you can use what you need for your recipe. With a little practice you will get to know when your starter is ready. Store ¼ – ½ cup of your starter in the refrigerator so you don’t lose it. Feed it every 2 weeks by letting it come to room temperature, and then feeding it with a small amount of flour and water, whisk and refrigerate again.